Coherent anti-Stokes Raman scattering (CARS) is a nonlinear four-wave mixing process that is used to enhance the weak (spontaneous) Raman signal. In the CARS process a pump laser beam (at frequency pump) and a Stokes laser beam (at Stokes) interact, producing an anti-Stokes signal at frequency CARS = 2 pump - Stokes. The Stokes beam ( Stokes) is typically provided by the 1064nm line from a Nd:Vanadate laser, which also acts as the pump source for an optical parametric oscillator (OPO), while the output from the OPO (680-1010nm) acts as the pump beam ( pump). When the frequency difference (beat frequency) between the pump and the Stokes beams matches the frequency of a (Raman active) vibrational mode, such as the CH2 symmetric stretching mode at ~2800 cm-1, the molecular oscillators are coherently driven. This results in an enhanced anti-Stokes (shorter-wavelength) Raman signal that is the basis for the increased vibrational contrast of CARS microscopy. 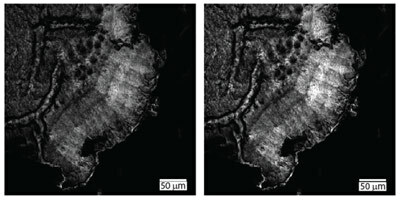 Figure 2: CARS microscopy images of cholesteryl palmitate from a fixed tissue sample. The image on the left was obtained using an emission filter commonly used in CARS microscopy experiments. The image on the right was obtained using Semrock part FF01-625/90 and shows enhanced image contrast over the same sample ROI. The same laser intensities and PMT settings were used when acquiring these images. Image courtesy of Prof. E. Potma (UC Irvine).